Since 1985, I have warned that the Big Bang was coming 2015.75. 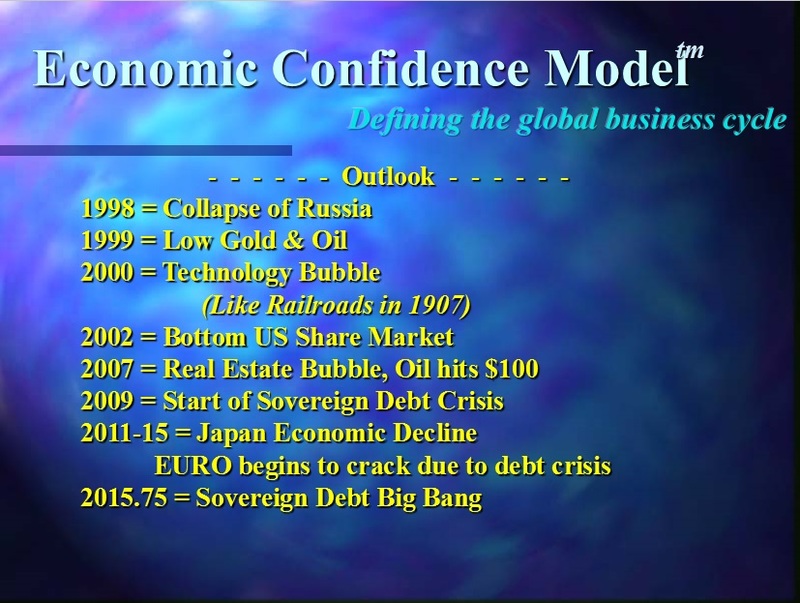 Here is the slide from our 1998 World Economic Conference (WEC). This target is the culmination of 51.6 years from the first break in the Bretton Woods Monetary system – 1964.15. So what was 1964.15? That was the end of silver coinage. The following year began the copper-nickel coinage. We should see important turning points in 2017 and 2020. We will be going over these targets at the upcoming WEC in November. There is a crisis unfolding in the bond markets right now. There is no bid for bonds and liquidity is vanishing rapidly. When the crack materializes, this is going to be so bad it is scary. This is BIG BANG in spades. « The Feds Are Hunting Money Retroactively – Is a Real Estate Crash Coming?